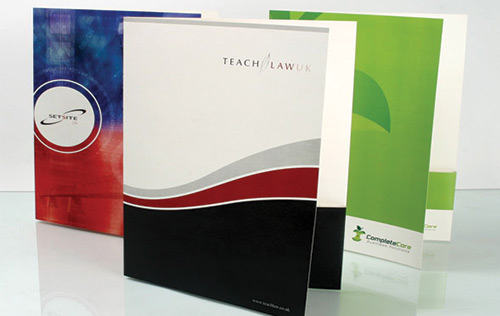 Presentations Folders are a flexible and professional way of presenting sales, marketing or personnel information. We can design and produce in formats to take A5 or A4, from a small number to numerous sheets, with slits for business cards, one or two flaps and in quantities from 1 – 1000 plus. FAST – We can design and produce folders in a few days. LOCAL – We can visit clients’ businesses at short notice to discuss your requirements. Free local delivery is part of our service - or you can collect from our centre in Clarence Street. We have a car park for customers’ use behind the centre.